Inferno is a 2016 American mystery thriller film directed by Ron Howard and written by David Koepp, based on the 2013 novel of the same name by Dan Brown. The film is the sequel to The Da Vinci Code and Angels & Demons, and is the third installment in the Robert Langdon film series. 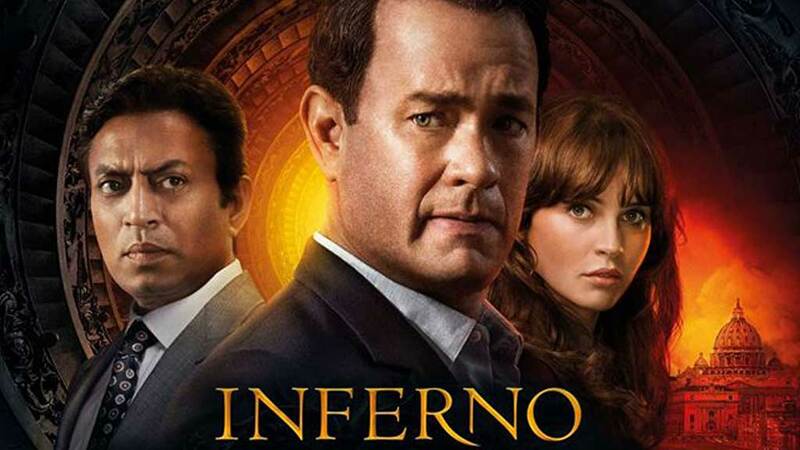 It stars Tom Hanks, reprising his role as Robert Langdon, alongside Felicity Jones, Omar Sy, Sidse Babett Knudsen, Ben Foster and Irrfan Khan. Together with the previous film, it remains Hanks' only live-action sequel. Filming began on April 27, 2015 in Venice, Italy, and wrapped on July 21, 2015 in Budapest. The film premiered in Florence on October 9, 2016 and was released in the United States on October 28, 2016 in 2D and IMAX formats. The film received mostly negative reviews from critics, but became a commercial success despite underperforming domestically. Inferno has grossed $34 million in the USA & Canada, and $185 million in other countries, for a worldwide total of $220 million against a production budget of $75 million, almost three times its budget.